Thank you for your emails and encouragement! It has been a source of great strength on this journey. Thanksgiving was great. Jamie and I spent it with the Leung Family as they hosted us and an international student Priscilla. Jamie and I had the pleasure of making some sugar cookies with two students from China but one of them left for a hot pot dinner (how I miss those). It was nice to be taken care of and spending it with a great family. This past Saturday was the mark of one year when I asked Jamie to marry me. It was the Saturday after Thanksgiving of 2004 when I popped the question. Things move so fast. It was a slow week but nevertheless, I had some things that have been in my heart for the new season…Here are some prayer items. Pray for diligence on my part to develop a good fund development plan and communicating the ministry goals. I will be meeting with a Mission Committee member at a church I will speaking at. 2. Preaching: Lately, I have been preparing a sermon for December 12th service at Chinese Community Church of New Jersey on Abraham. Speaking on the progression of faith as God calls us to growing faith and reversing our fortunes. 3. I have been asked to speak for New York Summer Conference for the youth track. I have enjoyed doing workshops there for past years. The theme is “Persevering Faith” from Hebrews CH 11 but more specifically the last 2 verses: 39-40. The dates are June 30-July 4th… it begins Friday evening and ends Tuesday noon. You’d be doing 4 morning messages (roughly 45 minutes each session plus one workshop topic, and 4-short 20 minute messages in the evening.) I am praying about this and seeing if God is leading me towards this. I have been less inclined to do “big” things since 2003 but I have to prayerfully consider it. 4. Jamie is on her final stretch of her semester and there are the collateral stress that comes with it. Pray that I can serve her during this time and that we can continue to seek His grace in our marriage. Last week, we focused our prayer on friendships and relationships that God has given us. This week we are focusing on vision and how God wishes to direct us towards His will. 5. The Herald Youth Center: They had their Herald Gospel Camp reunion this past Sunday and I am amazed how God continues to use this ministry to bring prodigals home. Pray that what was planted this summer will be part of their journey towards discipleship. Part of the reason why I am so passionate about laity is to equip the church to welcome this generation. 6. I am still in the midst of seeing how I can serve Syracuse Alliance Church, the local church Jamie and I are attending…They have asked that could be part of their strategic team and develop a mentoring model of outreach…I feel torn and yet excited about serving at a local church. Pray for wisdom and discernment, they asked that I attend a conference this weekend and also for me to be part of the debriefing meeting on Monday. But I am not sure if I could make it since Jamie and I were planning on attending a shower in NJ this Saturday. 7. I miss the engagement of faith and community. I find that it is hard to find people here in Syracuse who go “deeper” in their understanding of God. Something that struck me today in my devotion…. I am so hungry for that kind of fellowship…but yearning to be content where I am…. I am currently at the Syracuse computer lab writing this to you since my internet service at home is not doing too well. I hope you are all getting ready for your Thanksgiving Holidays with your family. I just returned from a Delaware wedding of a sister who attended a seekers group that my friend Harvey and I started shortly after 9/11 It was amazing to see her up on the stage as a bride. Three years ago, I remember her coming to small group with a sense of wonder and wanting to discover her faith. She later invited her best friend and in the course of a year journeying together, her and her friend found God. 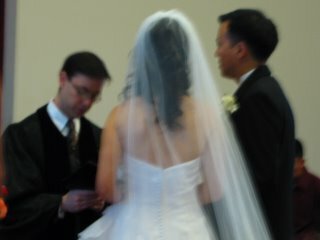 So there they were…one the bride and the other maid of honor…and I was amazed to see how God worked. To see degree of work He can accomplish when we are willing to seek His face. Then I took some time to reflect and saw so many of those who came to the group became believers. One of them, is getting baptized, another is reaching youth through her profession and I think of them and their names and I am inspired by the grace of God. During my ride back, Jamie asked “what made that smallgroup so special?” and all I could say was that it was God. I remember wrestling through many of the questions that they had and in the end, it was just a simple gathering where we all tried to uncover this mystery of grace. I don’t think I had answers…just presence. I went to Chinese Conservative Baptist Church (Jamie’s church) and I saw two youth from my work at Chinese Christian Herald Crusades and I was touched to see that his mother brought him to church. She shared that she was looking for me at CCHC and developing a heart for the Lord. * Pray for funding, I am working on a church prayer/mission support letter. I hope that it will be a source of encouragement for me as I am very far behind in my fundraising. * Pray for preparation for my sermon at Chinese Community Church of New Jersey, I will be speaking on the Reversal of Fortune: Renewal through Sacrifice. I am also meeting with the mission board for their support of my ministry with PaLM. * This past week, I was working a PaLM survey for the Asian American pastors to discuss the needs for the laity and I am approaching some Asian American leaders who can help come up with the survey with the appropriate questions and insights for the Asian American Academy. * I am still thinking a great deal about the issues of the first and second generation Chinese Church and the challenges that are facing a unified vision for ministry. I have committed to writing a paper on this subject and submitting it to review for publication. * Jamie and I are planning on staying in Syracuse for the Thanksgiving break since her parents are in Hong Kong and my parents are in San Francisco to be with my sister in certain personal transitions. Pray for wisdom and healing for the family as my sister is still seeking out her identity in Christ and for my parents to be a source of encouragement to her. We are hoping to host some international students on campus for dinner and to let them be part of our home and life here in Syracuse. * I have been ask to be part of the Strategic Team at the church Jamie and I attend. I am praying for wisdom and discernment on the level of commitment and time I can give to this church. They are in the midst of some renewal and changes and seek my experience with building leadership. * Pray for Jamie and I to continue to walk by faith, in our love for one another and for our marriage to be rooted in Him. Because of our schedules we have had a difficult time of a deeper devotion with God together. I hope that we can grow intimate towards God together. We are learning and He has put a desire in our heart for more of Him. “Christianity is not a message which has to be believed, but an experience of faith that becomes a message.” Edward Schillebeeckx. Sorry for the delay, my internet at home is down and when it runs, it is so slow! I am back from my trip in New York City. It was filled so many things. First, I want to thank you all of your for your prayers and words of encouragement. During my trip there was good news and some “yet to be good” news. I drove early on Wednesday morning to attend the Pastoral and Laity Ministries, there was a presentation by Chinese Coordination Centre of World Evangelism (CCCOWE). They are having a conference in Macau in March of 2006. The are having a Congress meeting for world evangelism; information on this Congress and their core values are here. After the presentation, we had lunch and I was able to pray with some pastors and was really encouraged by Pastor Steven Ro and Ben Ing for their words of honesty and how we are seeking to not be complacent in our passion and to see God’s people with a sense of love and promise. After our lunch… There was a roundtable discussion about the current situation/challenge of the American born Chinese ministers who have difficulties working under Overseas born Chinese leadership. It was a difficult but fruitful discussion and I was able to engage the pastors and lay leaders into a discussion regarding being missional towards the cultural complexities of being an American born in Chinese ministry. In the six years I served at Chinese Christian Herald Crusades, I have struggled in the context of sometimes difficult circumstances that seemed unjust but as I learned and learned about the importance of being missional (Urbana in 2003 was critical to my understanding of seeking to enter the lives of others) as a western minded. I meet with Greg Jao the new Regional Director of NY/NJ Intervarsity Campus ministries. He looked over the Asian American laity proposal (I have uploaded it on yahoogroup). They have agreed to have Intervarsity and their resources to partner with us in enriching and working with the Asian American laity. We are going to have a survey produced this month to identify the needs of the Asian American church and in Spring work with IV to develop a training and networking event. I had a meeting with Norman to go over preliminarily on the CCHC website. He will have something ready by the end of the week. On a personal note, I had a good meeting with some friends…Jinny, Koo, Harvey, Amy, Norman and Joanna. It was good to reconnect and to just veg, eat, pray and have some decent sushi. I was also invited to speak at Cornell University’s Grace Christian Fellowship for their Winter Retreat as well as the Hosanna Fellowship at Overseas Chinese Mission Church. Possible upcoming speaking engagements are at Binghamton Intervarsity and possibly at Teen Eastern Chinese Bible Conference in May of 2006. 2. I have not communicated the financial needs of the ministry. 3. Churches and people do not feel a need for this ministry, therefore there is no support. 4. I have to pray more about the provision. I have been spoiled with generous friends in the past and expected that this would be taken care of. 5. It could be charity exhaustion, this year with all the natural disaster, the support has gone to mostly these relief efforts and people are financially bound. Thank you for listening and praying. I know this was long and I appreciate you reading this. Wednesday night, I am going to have dinner with Broken For Good Records Recording artists Jinny Kim and Koo Chung for fellowship and continue to seek more direction about a follow-up to our youth Billy Graham Crusades Greater NY convergence outreach event called Refl3ctions we held at Overseas Chinese Mission this past summer. Thursday, I will meeting with some local pastors and ministry leaders who can possibly partner with me on this laity project. I am looking to work with some local seminarys like Alliance Theological Seminary to discuss possible training and development of training of laity. I am exploring the possibility of working with Westminster Seminary’s Masters in Urban Missions. Friday is my meeting with Greg Jao of Intervarsity who is regional director of NY/NJ and I pray that our meeting will expand a vision for equipping and strengthening the Asian American laity. Then I am having lunch with some friends and funders to thank them and to catch up. Last night, Jamie and I were able to send out some my Fall Ministry/Prayer support letter )if you would like to take a look at it, you can find it in the files sections of this group). to her friends and family. I am praying that God will use it to provide funding for this ministry. I will give you guys an update on my fundraising soon. On a personal note, It has been a hard time for me since moving to Syracuse to connect with my family. They are in the midst of renovating my former Rego Park Apartment and moving there. They have some time constraints for them since they have a trip to San Fran on November 15th to see my sister. Thanks for taking time to read this. Love you guys. I will post up pictures of my meetings in NYC and hope to update you soon. Let the light of your face shine upon us, O LORD . The gospel is the power to make things new…to bring light into darkness, life from death (Luke 1.78-79, Colossians 1.13), wholeness from brokenness (2 Corinthians 4:8-10, 2 Corinthians 7: 12-7-10)…beauty for ashes (Isaiah 61: 3)…The father welcomes the lost son into someone found with a garment, a ring and a feast (Luke 15: 22-24), the poor into the rich (James 2:5), it is this renewal and transformation that is to transform. This redemptive force of “making new” is the hope for a desperate and harried world. Where does this force reside? God has equipped us with the commission to be a royal priesthood (1 Peter 2:9 ) which puts us in a unique position of engagement as that of a king and a priest; a position that is not appointed by man but by a living God. As I move ahead in the new season of ministry with Pastoral and Laity Ministry of developing Asian American laity, it has been my passion and desire to bring to the sacred office of ministering towards each other and the community. It is in this movement of God’s people; a gathering of its people; a convergence; the church that I believe will transform lives in a city. This is something that has been a driving force in my desire to serve the Asian American church. I hope to bring community encouragement, practical resources and applicable strategies for the equipping to these faithful servants. This new ministry to forge a new vision for the laity came from my 6 years served with The Chinese Christian Herald Crusades as Director of the Herald Youth Center. Since Chinese Christian Herald Crusades is a parachurch organization, we focused on partnerships with the churches to accomplish the work of outreach, evangelism and community services. I experienced the leaders and their passion and love of Christ and the people. I realized that many were overburdened and sometimes in need of perspective. Many struggled with the context in which they were serving. To be able to develop a church ministry that was both personal and social in its approach to discipleship and outreach. In that interaction and friendships, I often fellowshipped with them to discuss measured theology, a balanced vision, divine compassion, incarnate presence, and our delight in our relationship with the one true living God. But another motivation is my passion for youth. In developing the Laity ministry, I wanted to see the emerging church to welcome the young people of this generation. Never, in the history of the world, has there been a more both dynamic and broken generation. Yet, in the church, the youth today are seeking a home for their spiritual and emotional cultivation. My hope is to continue to strive to make youth ministry into something that is dynamic and deep for this generation and to create an orthodoxy that is compelling and stirring among young people. I pray that you can be part of that with me. It is my hope and my conviction that it is a much needed ministry to serve the Asian American community. My hope is towards bring a vision that is focused on discovering the legacy of those who came before us, who can provide a beacon to discover new ways of pursuing ministry so we can initiate a movement to build His church. Thank you for listening!